We're ready for the 2020 redistricting cycle...Are you? 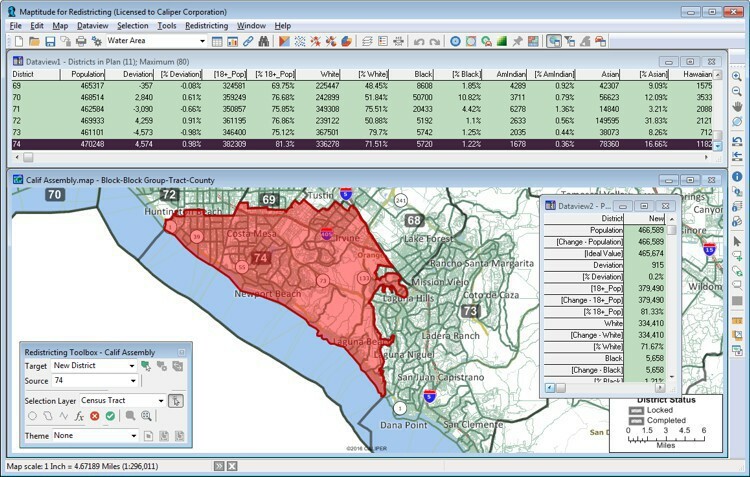 Maptitude for Redistricting software has defined the redistricting software market since its introduction in 1997. Designed with the help of redistricting professionals from many of the state legislatures and political parties, Maptitude for Redistricting works the way you work, has the features you’ve requested, is easy to learn and use, and is 100 percent reliable. No wonder it was used by a majority of the state legislatures during the 2000 and 2010 redistricting cycles. 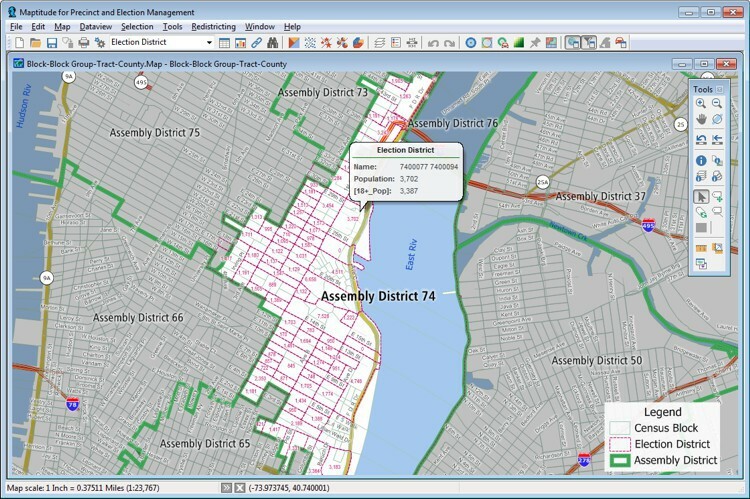 Whether you are an existing client or new to Maptitude for Redistricting, you will thoroughly enjoy this new version of the software as you prepare for 2020. The newest version provides advanced features, the latest Census geography and data, one-button conversion of existing plans to the latest TIGER geography, new and enhanced reports, a state-of-the-art interface, open access to industry-standard file formats, expanded file support for Google Earth Documents, MapPoint files, and more, speed improvements, and more. Create any number of plan types (e.g., congressional, state house, senate, school district), and save them as Plan Templates. To create a plan, simply choose a template or an existing plan and enter a new name. Organize plans in libraries by plan type, user, security access, etc. Locate, copy, change settings, and password-protect plans. Group similar plans into plan sets and define report sets for batch printing. Maptitude Online Redistricting is web-based redistricting software designed for states that want to provide individual citizens with a means to draw a redistricting plan and for state legislatures with members who wish to play a role in the redistricting process but who are not among the key players. Because the PC and online versions share common file formats, plans developed online can be electronically submitted to the central redistricting office, opened in the PC-based software, and analyzed to the full extent as if they had been created using the PC-based software. Maptitude for Redistricting includes on-line help and detailed manuals packed with step-by-step instructions and tutorials. The Plan Manager leads you through the process of creating your first plan and speeds the creation of all additional plans. Other wizards help you create maps, display data using meaningful themes, and geocode information based on street address. In addition, Caliper offers training at your site or at our headquarters in Newton, Massachusetts. Maptitude supports over 50 file types and more than 100 GIS and CAD file formats allowing you to easily migrate your existing geographic data. You can map Esri Shapefiles, Geodatabases, MapInfo TAB files, and Oracle Spatial tables directly, or use the built-in translators to import geographic data from a variety of other software packages and public sources. This extensive library of importers and exporters is one of the largest in the industry and comes at no additional charge. Export plans (geography and data) to these other formats for use with your existing software. You can also use satellite or aerial photographs directly in your maps. Maptitude includes toolboxes for quickly accessing on-line images from Virtual Earth and Google Earth. These images can be used as a means of reference or in conjunction with the redistricting tools to draw your districts. The Maptitude for Redistricting Plan Manager makes it easy to manage thousands of plans stored on a computer network. You can quickly find a plan by type, creator, date, key word etc. The Plan Manager lets you distribute plans for viewing and perform plan management functions across the enterprise. Data and plans can be stored on individual machines or on one central server with access controlled by both Maptitude for Redistricting and the network administration software. Maptitude for Redistricting lets you save your plans (maps, data tables, charts, layouts, and reports) as JPEG, PNG, and HTML files for static Web publishing. Caliper Corporation’s Maptitude for the Web software makes it easy to publish your plans as interactive mapping applications on the Web. For example, a user can locate their address on the map, pan and zoom, query the district assignments, and display tables of data from their browser. Maptitude for Redistricting also lets you add your plans to Google Earth or Google Maps and add Google Earth images to your plans in Maptitude. Caliper provides database development, hands-on training, software customization, web design, telephone support, on-site support, priority support, and other related consulting services on a time and materials basis. To learn more about the reapportionment features in Maptitude for Redistricting, please see the Features page or contact Caliper Sales at sales@caliper.com or by phone at 617-527-4700.